Happy Wednesday! Today I am working a long(ish) day before coming home to do a TON of math. Thankfully, yesterday was registration day for the next semester and I chose a WAY easier math so I am very happy. Today's post is the second half of my SEC outfit series. 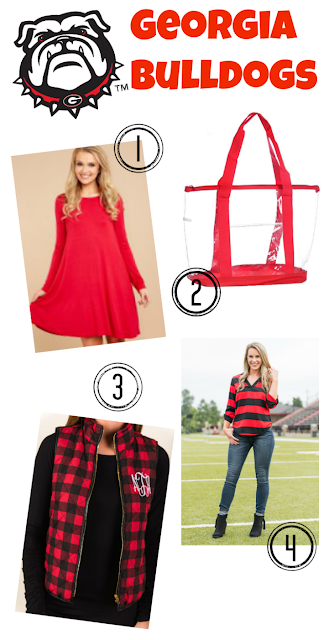 You can see my SEC West outfit ideas post here. I love these outfits I pulled together and hope you get some inspiration! I love the garnet and black combo and that purse is beautiful right?? I love classic blue and white! There are so many different pieces out there but I LOVE that bracelet! The mother land :) I don't know if y'all know this, but I was born in Knoxville close to the UT campus! There you have it! Have a great Wednesday!